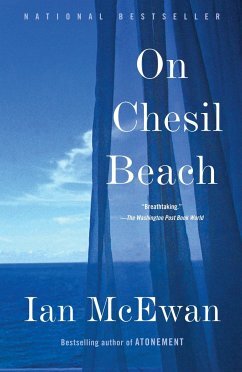 From the acclaimed author of "Atonement" comes a novel of remarkable depth and poignancy. Set in 1962, "On Chesil Beach" captures with understanding and compassion the innocence of a young newlywed couple at a time when marriage has been presumed to be the outward sign of maturity and independence. Ian McEwan is the critically acclaimed author of seventeen books. His first published work, a collection of short stories, First Love, Last Rites , won the Somerset Maugham Award. His novels include The Child in Time , which won the 1987 Whitbread Novel of the Year Award; The Cement Garden ; Enduring Love ; Amsterdam , which won the 1998 Booker Prize; Atonement ; Saturday ; On Chesil Beach ; Solar ; Sweet Tooth ; The Children Act ; and Nutshell , which was a Number One bestseller. Atonement and Enduring Love have both been turned into award-winning films, The Children Act and On Chesil Beach are in production and set for release this year, and filming is currently underway for a BBC TV adaptation of The Child in Time . "This is McEwan's mature style, one we have come to recognise from Atonement and Saturday. It is a polished, civilised style, and very distant from the shock tactics of his early work... McEwan brings Florence and Edward touchingly alive for us; and their seriousness, their idealism, and their desire for love draw us towards them"